As dramatic a game as it was, Friday night’s clash between the Harvard men’s hockey team and No. 2/3 Clarkson ended in anti-climactic fashion. After three lead changes, five advantages erased, and 12 goals altogether, the Crimson and the Golden Knights skated to a 6-6 draw. The Crimson (8-6-4, 7-3-3 ECAC) thrust the game into overtime after junior forward Lewis Zerter-Gossage leveled the score with under a minute remaining in regulation. With the net unguarded and the extra skater on, a puck popped out of a pile-up around Clarkson net-minder Jake Kielly, and Zerter-Gossage was there to bury the equalizer, his second of the night. Despite the Golden Knights’ plea to the referees, the puck was deemed loose and Kielly unimpeded. The goal stood. Horton, scorer of his team’s fifth goal, seemed confident that the last-minute equalizer was coming. Don’t let Harvard’s late-game heroics fool you—the visitors owned a two-goal lead at one point in the third period. But a flurry of shots and a favorable bounce allowed Clarkson (18-3-2, 10-0-1) to even the contest by the mid-way point of the final regulation frame. Five minutes after notching the score, the Golden Knights seized the lead. Crimson junior Adam Baughman slipped with the puck in the defensive zone, and the home team ultimately capitalized on this misstep. Junior forward Marly Quince ripped a one-timer from the high slot, which beat junior goaltender Michael Lackey. And just like that, Harvard’s 5-3 lead over a top-five team had not only vanished, but it had also been overtaken with little time to spare. While Lackey finished the game between the Crimson’s pipes, he did not start it. Coach Donato yanked Harvard’s usual backstop, tri-captain Merrick Madsen, after he allowed his fifth goal of the evening on a slapshot from beyond the blue line. The overtime period saw multiple chances for both teams but concluded in an indecisive draw nevertheless. In this theatrical game, the third period was more so the final act—the culmination and climax of all earlier drama. Each frame contained its share of back-and-forth action, which further escalated the emotion. Friday’s bout got off to a thrilling start, as the teams traded goals within the first five minutes. By comparison, however, the opening frame was simply the calm before the storm. Almost three minutes into the second period, the Harvard icemen captured their first lead of the night when junior forward Ryan Donato broke the 1-1 tie. The Boston Bruins prospect and future Olympian entered the zone with speed and soon found himself one-on-one with Kielly. A quick deke to Donato’s backhand was the last thing the sophomore backstop saw before the puck crossed his sacred threshold. The Crimson enjoyed a 2-1 advantage for ten minutes before Golden Knights sophomore Heralds Egle snuck a tough-angle shot past Madsen. The unlikely goal was good for the Latvian forward’s second strike of the season. 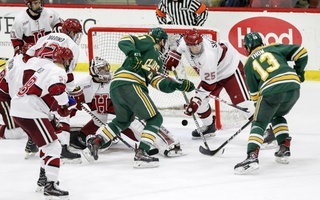 But just when Cheel Arena had settled down from the equalizer, the visitors spoiled the fun. It was Donato’s linemate, Zerter-Gossage, who found twine just two and a half minutes after the Egle snipe. After the post bailed out Madsen on a Clarkson odd-man rush, Zerter-Gossage picked up the puck and led a counter-attack toward Kielly. At the right circle, the junior fired a wrister and snapped a seven-game goalless stretch by beating the tender top-shelf. The next play epitomized this back-and-forth play. Harvard skated with the lead for all of 17 seconds before the Golden Knights responded. This time, rookie forward Josh Dickinson buried his 11th of the year. The late-period frenzy sent the two teams into their locker rooms notched at three after 40 minutes. Despite most of the drama occurring in the final two thirds of the game, the early stages of Friday’s clash resembled the latter portion’s score-and-response style. The Golden Knights wasted little time giving their home fans something to cheer about, as they lit the lamp just a minute into the contest. With a mere 50 ticks off the clock, forward Jack Jacome received a breakout pass at his own blue line from senior defenseman Terrance Amorosa. The shifty 5’7” freshman strode along the boards and split two Harvard defenders on his way into the Crimson zone. Jacome slowed and looked to pass before ultimately calling his own number. The early strike was just the start of a productive night for the first-year forward, as Jacome finished with three points (2–1—3) and a plus-three rating. Finding itself already trailing in a game just a minute old, Harvard ramped up the intensity and struck back only three and a half minutes later. 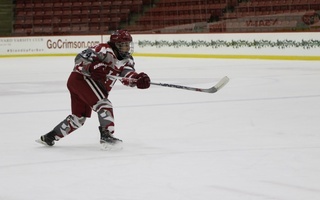 During an effective shift for the Crimson featuring extended zone time, Horton regained the puck at the corner boards and slipped it to freshman linemate Benjamin Solin. The rookie fed junior Michael Floodstrand, who bowled toward the cage and punched it home despite getting leveled from behind after the play. After Floodstrand’s goal, both teams locked in and proceeded to play out an instant classic. And it’s not every day that you can say that about a tie. 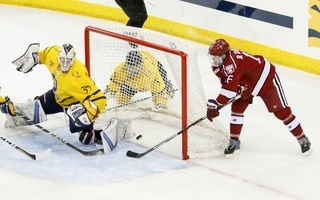 — Harvard goaltender Merrick Madsen recorded an assist on junior Lewis Zerter-Gossage’s first goal of the game. The tri-captain backstop now has three assists to his name while sporting the crimson and white, with the most recent one coming last February against none other than Clarkson. 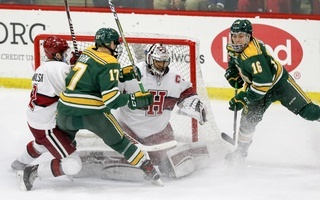 — Friday night marks the fourth contest in Harvard’s previous five to reach overtime. The Crimson has only avoided a tie in one of those four bouts, as it nabbed the win against Union (4-3) thanks to freshman Henry Bowlby’s last-second game-winner. — Clarkson entered Friday’s tilt riding a 14-game winning streak. By drawing Harvard, the Golden Knights see that streak come to a close. Additionally, the tie blemishes the flawless 10-0-0 record that Clarkson had logged in ECAC play prior to the game.